Joan Beiriger's Blog: Art Licensing Editorial: Can You Make a Living Licensing Art Now? Art Licensing Editorial: Can You Make a Living Licensing Art Now? 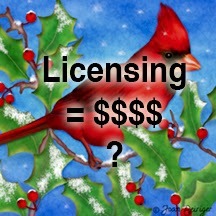 One of the most asked questions by artists interested in licensing their art is "Can you make a living licensing art?" Five years ago before the start of the great recession (started late 2007 but often referred to as 2008) many artists were able to get enough licensing deals that they actually could make a living licensing their art. Now six years later because of the change in economy and consumer spending, the art licensing industry is much different and less artists are able to make a living ONLY from licensing their art. Most of the artists that do make a living by licensing have been licensing their work for years, have built a consumer following, and have a solid relationship with the manufacturers that license their work. The impact of the great recession on consumer spending has created a new norm of bargain hunting according to "How the Great Recession has changed the way we shop – even during the holidays." Consumers are looking for discounts and expect it from retailers. And, they are not splurging as much as they did before the recession and normally only buy what they need. It is predicted that this change in consumer spending will NOT shift back to pre 2008 spending. Retail stores are giving consumers what they want with constant discounts at stores such as clothing at Kohl's, and fabric and hobby supplies at JoAnn Fabric and Craft. And to attract consumers to their stores and make more revenue, chain stores are turning into one stop shopping that include food items such as at Walmart and Target. Also, many retailers not only have brick-and-mortar stores but also sell their products on the internet. Service centers not usually associated with the selling of products are now selling items related to their service such as t-shirts at exercise centers. Even the U.S. Postal Service offices sell greeting cards and other products. Of course the shift in consumer spending has a huge impact on the art licensing industry. Retailers are buying less products and many times discount seasonal items well before the end of the season. This results in manufacturers often doing only one production run of the product and producing less products than pre 2008. Thus, artists get less revenue for the design and it may not be produced again the following year even though the licensing contract will not expire for several more years. So what can those artists new to licensing or those not yet making a living licensing their art do to improve their revenue? Licensing agent Maria Brophy had the same dilemma that many businesses did during the recession. In an article, Maria said "In 2008, when everyone was hit hard by the recession, Drew and I were still going strong with our business of selling and licensing art. But our revenues gradually started to decline, as many of our best clients and licensees, went out of business. OUR INCOME DROPPED BY 40%. Then it continued to tank… By 2011, we were bringing in 50% of the revenue we were earning before the recession. And we started to panic. You see, just like many small business owners, we thought the recession would be a temporary thing, and that we would go back to selling art in the way we always did. But we were wrong. Things changed and never went back." Read what Maria did to counteract the decline in her business of selling and licensing Drew's art by reading "Where the Money is Hiding and the Thriving Artist Summit". If you read, Maria's article you will find that even before the recession she and Drew were not just licensing Drew's work but also selling it. The term often heard in art licensing is "don't quit your day job" is so true. Not all artists can earn enough in licensing and they need other means of revenue to support themselves. Some have full or part time jobs that may or may not be related to art. Some sell their art in galleries, at art and craft shows, or do commission work. And, others sell their art on internet stores. Read, "Art Licensing: Should you sell art on POD stores?" for the pros and cons on having a print-on-demand internet store. Licensing art has never been easy. And, it has gotten harder. Licensing experts that have been in the industry for decades state that what worked previously in successfully licensing art does not always work now. There are less retailers purchasing products with licensed art on them. And, manufactures have much more art to choose because there are more artists licensing their art. Thus, the number of available licensing deals are less and spread among more artists. So the bottom line is that you may not be able to make a living just by licensing your art even with the improvement of the economy. Licensing art can be a good way to bring in revenue but you still may need additional ways to make a living. The change in the licensing industry mean that artists not only should but MUST change the way they approach licensing. Getting licensing deals is very competitive and the more the artist stands out in having the right art and willingness to satisfy the manufacturer the better chance for her/him to license art. • create art that the consumer want on products. That means you must research each product industry to learn what themes and color combinations consumers are attracted to so they will buy the products and manufacturers will license your work. • send art that fits the manufacturer product line. You should analyze why your art fits (or not) specific products for specific manufacturers and be able to explain the reason why your art should be licensed to the manufacturer if asked. To find out why you should do this, read art agent Jim Marcotte of Two Town Studios surprising article "Dude, what's Your Problem?" • send art for licensing consideration in the proper formats. For instance, do not send horizontal or square images to flag manufacturers. They need images that are formatted vertically. However, if the manufacturer also license art for floor mats and/or mailbox wraps then an image formatted horizontally is not only appropriate but wise to send with the vertically formatted image. • send collections of art to manufacturers that require multiply images for their products. For instance, images for tabletop ware often require a collection of multiple central images, borders and patterns but a greeting card only need central images. Thus, there is no need to send patterns and borders with the central image to greeting card manufacturers if that is the only product they manufacture. • send mock-ups of the product if appropriate so that the manufacturer can see what the art will look like on the product. Greeting cards and flags do not need mockups but it is advisable to send mock-ups for a collection of art to tabletop manufacturers. • be willing to edit art to manufacturer specifications and tell them so when you submit the art. • be willing to send high resolution (HiRes) art to manufacturers when requested for client presentations. Many manufacturers presell their products before producing them. Note: Requests for HiRes art are without any assurance that the art will be licensed. And, sending the art is done without a contract so the artist needs to trust the manufacturer before sending them. • And, most importantly build relationships with manufacturer art/licensing directors and follow up after submitting art. Read art licensing agent Jim Marcotte of Two Town Studios article "Hey Remember Me?" on the importance of building relationships with manufacturers and follow up. Your comments are welcome. Click on the comments section (below) to write your comment. Note: Some people have a problem in leaving a comment. The most successful method is to comment as Name/URL (your name and website or blog with a "complete" URL address). nice article, very interesting. thanks! Thanks so much, Joan! Your articles are always so informative and helpful. Thank you, Joan. It's very important to confront the reality of what we face. We may create dream worlds but living unrealistically won't do any good. Changing our strategies and expectations is the best way to move forward. Thank you and the writers of the other helpful articles. Joan, I very much appreciate the insights you continue to provide on your blog. They are invaluable to us newbies! Thanks so much, Joan . . . lots of good info, as YOU always do!! So true, been painting since college. I thought I could ride out this cycle. Reality finally hit me, that I better get a day job…too bad, I'm better now than I ever have been. Dear Joan Once again a great article. Thanks so much for all the information you put out there about licensing art. So basically you CANNOT make a good living in art licensing….You need to have a day job. Good info before one sinks money in to e-books, online classes and the like on this industry! I NEVER say that you cannot do anything. There are artists that DO make a good living in art licensing but not as many as five or ten years ago. What the intention of my article is to warn artists that licensing art has changed and that they have to work darn hard and probably have some luck in order to earn a good living. As agent Maria Brophy said in her article ". . . we thought the recession would be a temporary thing, and that we would go back to selling art in the way we always did. But we were wrong. Things changed and never went back." And, all indications is that licensing art will never be the same and artists must figure out new ways to license their art to be successful and hopefully make a good living. In the meantime, don't quit your day job. I am so thrilled to have found your blog. What a wealth of information!! I took the e-course by Lila Rogers and found it's very tough for a "traditional" artist to make and submit art for various venues and most of it is done in Photoshop or Illustrator. While the course was incredibly helpful and I learned a ton, I was frustrated with the overall sameness of the art as, in the end, it's all computer generated. Do you find this to be true as well or is there a niche for traditional artists? If so, what would that niche be? I'm glad that you found my articles useful. It is important for artists interested in licensing their work to get information about licensing from various sources because everyone has a different viewpoint. There is no right answer! Although knowing how to use Photoshop to license your work or hire someone that knows Photoshop is imperative in licensing, an artist that paints their creations more often get licensing deals for ALL kinds of products than artists that generate them in computer software like Photoshop. The exception to that is in the fabric industry where patterns generated in Illustrator seems more the norm because of the ease in changing the colors for different fabric colorways. Traditional artists do need to scan their art into the computer so that it can be manipulated and edited in Photoshop to the manufacturer specifications and also can be sent electronically to the manufacturer. But most importantly, creating themes that is wanted by consumers (flowers, animals, Christmas, coastal, etc) so they will purchase the products is a MUST to be successful in licensing art. Good luck!